The TOTO Supreme II Toilet that is included in this toilet and bidet system doesn’t just look great, it performs well too. Equipped with TOTO’s special Tornado Flush technology and a coating of CeFiONtect glaze on the bowl, the Supreme II toilet mounts a masterful defense against residue accumulation. 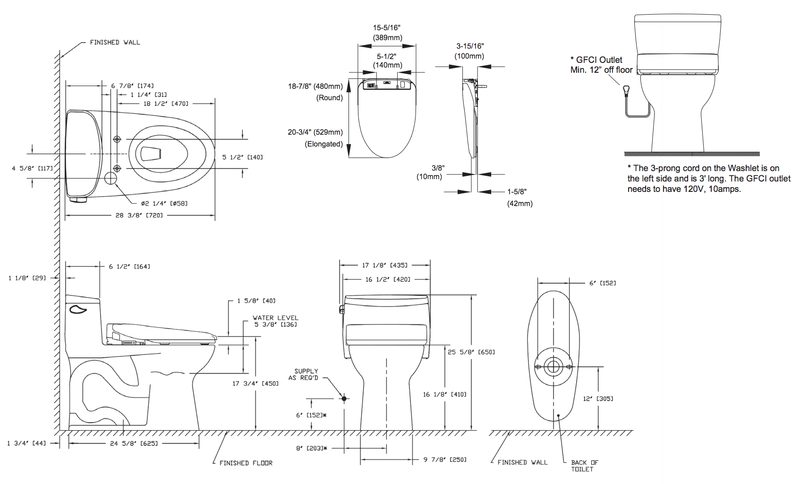 The toilet itself is a universal height and ADA compliant, so it’s accessible to a wide range of individuals, and it’s been specially crafted to hide the cords and hoses of the S350e bidet seat that is included with your purchase. The S350e Washlet+ bidet seat comes with nearly every feature available on the market today for a truly exceptional experience. Four wash modes (front, wide front, rear and soft rear) provide thorough cleansing, and the wash water pressure, water temperature, wand position, and heated seat are all adjustable according to your personal preferences. Oscillating and pulsating spray options provide extra relief and relaxation, and the seat’s warm air dryer provides the option of foregoing expensive and abrasive toilet paper. The S350e comes with a built-in deodorizer to eliminate unwanted odors, and the nightlight illuminates the bowl with a gentle glow to make nighttime restroom trips both safer and easier. The automatic open/close lid gives you the option of a truly hands-free bathroom experience, and it’s also sure to wow your guests. Two user presets provide additional convenience by giving you the option of programming your favorite settings into the remote for a fully customized wash and dry at the touch of a button. What’s more, the S350e uses sterile, electrolyzed water (eWater+) to coat the bowl prior to use—thereby making it hard for waste to stick—and to sanitize the unit’s nozzles after each use for added hygiene and peace of mind. Whether you’re new to the world of bidets or have enjoyed their benefits for years, the TOTO Supreme II Washlet+ S350e One-Piece Toilet and Bidet System is sure to impress!